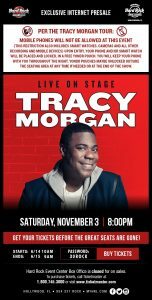 * Exclusive Internet Presale- Tracy Morgan. Jeff Eats and Mrs. Jeff Eats aren’t fans! If you are, this may work for you!